Galerie Bernheim-Jeune et Cie., Paris (by 1913). William A. Cargill, Carruth, Bridge of Weir, Scotland (by 1953); Estate sale, Sotheby's, London, 11 June 1963, lot 38. Paul Kantor Gallery, Beverly Hills (acquired at the above sale). Mr. and Mrs. Sydney R. Barlow, Los Angeles (1974); sale, Sotheby's, New York, 21 May 1981, lot 511. Bernheim-Jeune, ed., and O. Mirbeau, intro., Renoir, Paris, 1913, no. 40 (illustrated; dated 1894-1895). A. Vollard, Tableaux, pastels et dessins de Pierre-Auguste Renoir, Paris, 1918, vol. II, p. 76 (illustrated). Bernheim-Jeune, ed., L'Art Moderne et quelques aspects de l'art d'autrefois, Paris, 1919, vol. II, p. 96 (illustrated, pl. 113). G. Besson, Renoir, Paris, 1938, no. 29 (illustrated; titled La Lecture and dated 1890). The Scottish Art Review, vol. IV, no. 4, 1953, p. 19 (illustrated). "Death Unveils Art Collection Worth Millions" in New York Post, 2 May 1963. G.-P. and M. Dauberville, Renoir: Catalogue raisonné des tableaux, pastels, dessins et aquarelles, Paris, 2009, vol. II, p. 195, no. 998 (illustrated; with incorrect provenance). Paris, Galerie Bernheim-Jeune et Cie., Renoir, March 1913, p. 61 (dated 1894-1895; with incorrect dimensions). Los Angeles County Museum of Art, March-May 1974 (on loan). New York, Wildenstein & Co., Inc., Renoir: The Gentle Rebel, October-November 1974, no. 38 (illustrated in color, pl. IV; titled Young Girls Reading and dated 1890). Kunsthaus Zürich, July 1981-March 1991 (on extended loan). The late 1880s and early 1890s represent a watershed period in Renoir's career. In the opening weeks of 1887, the artist put the finishing touches on Les grandes baigneuses, a veritable manifesto of the linear, Ingresque style that he had begun to develop three years earlier. He had high hopes for the monumental painting of five frolicking nymphs, which he had meticulously planned in some twenty preliminary studies. His goal, he told his friend and patron Paul Bérard, was to "beat Raphael" (quoted in B.E. White, Renoir: His Life, Art, and Letters, New York, 1984, p. 166). When the painting was exhibited in May at the Galerie Georges Petit, however, critical response was emphatically negative. After brooding throughout the fall over this disappointment, Renoir rebounded with vigor in early 1888. He began to travel again widely, seeking inspiration in the richly colored art of Titian, Rubens, and the French Rococo, and he renounced the cool tones, dry surface, and hard-edged contours of Les grandes baigneuses. "I have taken up again, never to abandon it, my old style, soft and light of touch," he told Paul Durand-Ruel. "It's nothing new, but rather a follow-up to the paintings of the eighteenth century. This is to give you some idea of my new and final manner of painting (like Fragonard, but not so good). Those fellows who give the impression of not painting nature knew more about it than we do" (quoted in Renoir in the Barnes Foundation, New Haven, 2012, p. 121). Renoir's new approach was an immediate success, ushering in a decade of mounting prosperity and long-awaited fame for the artist, who was by then nearing fifty. Durand-Ruel began to buy eagerly from Renoir once more, confident in his ability to find buyers. "I'm in demand again on the market and I worked a lot in the spring," the artist wrote to Bérard in 1890. "If nothing happens to disturb my work, it will go like clockwork" (quoted in G. Adriani, Renoir, exh. cat., Kunsthalle Tübingen, 1996, p. 50). In 1892, the French State purchased Renoir's Jeunes filles au piano for the Musée Luxembourg, a mark of official recognition that the artist himself viewed as one of his crowning achievements (Dauberville, no. 993; Musée d'Orsay, Paris). Later the same year, Durand-Ruel mounted a large retrospective of Renoir's work that was exceptionally well-received--"the beginning of a triumph," the critic Arsène Alexandre proclaimed (quoted in Renoir in the Twentieth Century, exh. cat., Los Angeles County Museum of Art, 2009, p. 371). The linchpin of Renoir's work during this period was a long sequence of paintings depicting the carefree, idyllic recreations of pretty bourgeois girls, informally dressed in summer frocks and ribboned sunhats. "It was with pictures such as these, it seems, that the artist found a real market in the 1890s," John House has noted (Renoir, exh. cat., Hayward Gallery, London, 1985, p. 251). Renoir most often painted the rosy-cheeked, snub-nosed models in pairs, placing them in a generalized, luminous outdoor setting, where they pick flowers, talk, draw, or read. They appear softer and more idealized than the naturalistic young grisettes or working girls whom Renoir had painted in Paris during the 1870s, and their poses are reserved and innocent, with none of the provocative undertones that sometimes characterize his earlier genre scenes. Instead, it is the girls' concentrated activity and harmonious interrelationship that form the keynotes of these modern-day fêtes champêtres. "Their gestures are typical, rather than suggesting a captured instant or incident, and their grouping presents their shared activity as something natural and harmonious, without a hint of psychological engagement or any more precise narrative," House has written. "The viewer has no direct access to their experience, but looks in from outside on to their self-contained world; at the same time the whole picture--sunlit landscape, young girls and flowers--presents the viewer with a vision of harmony and integration" (ibid., pp. 256-257). In the present painting, the focus of the two girls' attention is a small book or pamphlet that one of them holds open, the sunlight glancing across its pages in bold white accents. The girls appear absorbed in their quiet reading, lending the image a dreamy, subdued intimacy (à la Corot) that contrasts with the rapid, fluid brushwork and jubilant coloration. Although Renoir was skeptical of all literary influences in visual art ("Pas trop de littérature, pas trop de figures qui pensent," he is said to have insisted), reading forms an important recurring motif in his oeuvre (quoted in G. Adriani, op. cit., p. 204). During the 1870s, he painted portraits of Claude Monet and his wife Camille engrossed in a book, genre scenes with a romantic frisson that depict couples sharing a paperback or newspaper, and informal, modern-life sketches of anonymous female models reading (fig. 1). Although his preoccupation with the depiction of l'éternel féminin led him to eschew bookish diversions during the mid-1880s, he returned to the motif in earnest around 1890, painting at least fifteen images of young girls reading during the first half of the decade alone (figs. 2-3). In the last years of his career, his favorite models Gabrielle and Andrée are repeatedly shown with an open book (fig. 4), as are his sons Coco and Jean. Renoir preferred his models to appear natural and unself-conscious rather than artificially posed, and placing a book in their hands distracted them from the task of sitting at length, allowing him to examine every detail of their appearance and surroundings at his leisure. Pictures of girls reading had been popular at least since the era of Fragonard and Greuze, often carrying a moral or sentimental overtone. 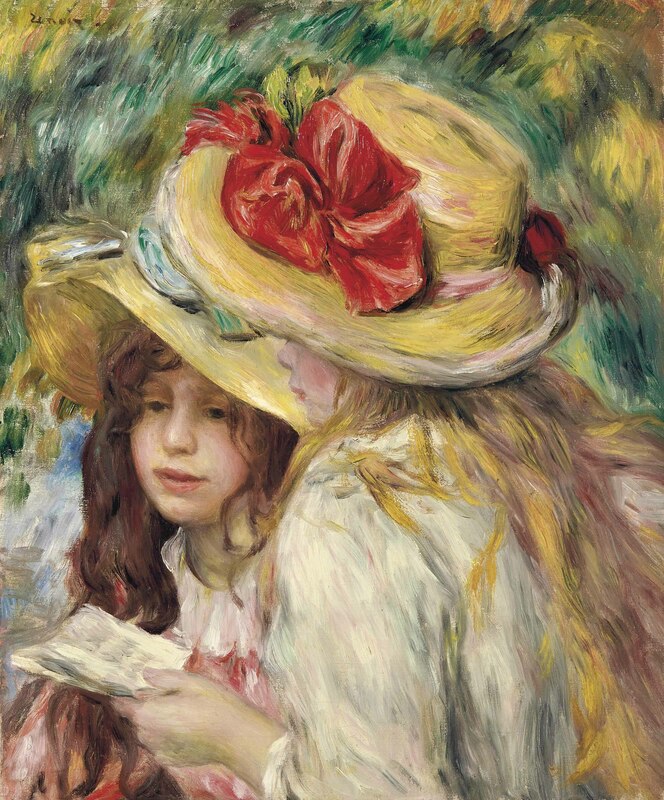 In Les deux soeurs, Renoir wittily questions the viewer's expectations of the theme by concealing the eyes of the model in the foreground and displacing the visual focus of the picture from her diminutive, sketchily rendered book to her eye-catching, crimson-ribboned sunhat, with its sweeping, gold-colored strokes. Renoir had a particular penchant for elaborate women's hats, which embodied for him the visual pageantry of the everyday world. In a letter dated 1880 to an unidentified model, the artist wrote, "Come to Chatou tomorrow with a pretty summer hat. Do you still have that big hat that you look so nice in? If so, I'd like that, the gray one, the one you wore at Argenteuil" (quoted in ibid., p. 204). In the later 1890s, Durand-Ruel tried to persuade Renoir to begin depicting his sitters bare-headed, since the fashion for hats was waning, but the painter refused, citing his taste for "beautiful fabrics, shimmering silks, sparkling diamonds--though the thought of adorning myself with them is horrifying! So I am grateful to others when they do so--provided I am permitted to paint them" (quoted in ibid., p. 204). According to Dauberville, Les deux soeurs was probably painted at Mézy, where Renoir frequently visited Berthe Morisot, her husband Eugène Manet, and their daughter Julie during the summers of 1890 and 1891. "Renoir came several times to stay at Mézy, sharing Berthe Morisot's models or setting out early in the morning to make little sketches of the surrounding countryside," Julie's son Denis Rouart later recorded. "Knowing that he was always expected, he would arrive unannounced with his suitcase" (quoted in A. Clairet, D. Montalant and Y. Rouart, Berthe Morisot: Catalogue raisonné de l'oeuvre peint, Montolivet, 1997, p. 98). The brunette in the present scene is likely Julie herself, who was twelve years old in 1890, and her companion may be Jeanne Gobillard, the daughter of Morisot's eldest sister Yves. Dauberville identifies the blonde model as Jeanne's sister Paule, but she was a young woman of twenty-two by this date; Jeanne, in contrast, was just a few months older than her cousin Julie, and thus still very much a girl. At Mézy, Julie and Jeanne posed repeatedly for Morisot--climbing a tree, picking cherries, hanging a bird cage, playing the flute, feeding a goat, or playing in a stream. Sunlit and harmonious, these idyllic visions of young bourgeois girls enjoying the pleasures of the countryside reflect Morisot's ongoing artistic dialogue with Renoir during this transformative interval in both of their careers. Renoir had been one of Morisot's most ardent supporters since 1877, when he invited her to participate in the Third Impressionist Exhibition. Their friendship blossomed during the next decade, when he began to frequent her celebrated Thursday soirées on the rue de Villejust and their social circles merged. In 1885, Julie recorded in her diary, "M. Mallarmé and M. Renoir were the closest friends, the Thursday regulars" (quoted in B.E. White, op. cit., p. 192). Renoir painted Julie's portrait in 1887 (Dauberville, no. 1232; Musée d'Orsay, Paris) and made a double portrait of Morisot and her daughter in 1894 (Dauberville, no. 997; Christie's, New York, 8 May 2000, lot 27). When Morisot died the next year, leaving Julie an orphan at seventeen, she named Renoir and Stéphane Mallarmé as joint guardians. Although Julie lived with Paule and Jeanne Gobillard, who had lost their own mother two years earlier, all three of them--"the little Manet girls," as they were called--spent summers with Renoir and his family in Brittany and took painting lessons from the master. In October 1895, just a few months after Morisot's death, Julie wrote, "We are leaving the Renoirs, M. Renoir who has been so kind and charming all summer; the more one sees of him, the more one finds him an artist, fine and of an extraordinary intelligence, but on top of that with a sincere simplicity" (quoted in ibid., p. 201).